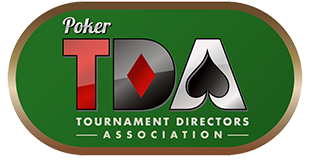 The Poker TDA Forum is a great resource for discussing poker tournament rules and tournament management issues. The Forum is located at this link and is available for viewing by all persons; however only TDA members are permitted to post in the discussion threads. If you would like to register to post in the Forum, you must first Join the TDA here.. Once you join the TDA, use the form below to register to post on the Forum. GUIDELINES: The TDA Forum uses this offsite registration form in order to eliminate spam on the Forum. You will receive an e-mail (usually within 1-2 days) requesting confirmation of your contact / username / and PW before you will have permission to post on the Forum. You must respond to this e-mail for your Forum registration to be active. Register using the form below. Please choose a username that contains both lower and uppercase letters and at least two numbers (example: Roger23, monicaG41, etc.). I am a TDA member in good standing and would like permission to post on the Poker TDA Discussion Forum. I agree to abide by the terms of service of the Forum.